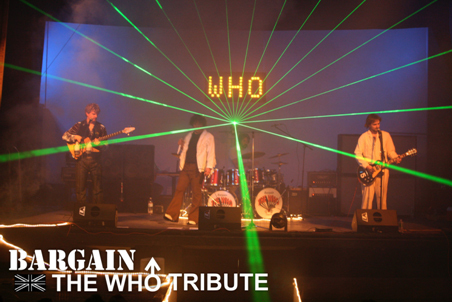 BARGAIN ® is the most requested Who Tribute band in North America. Revered nationwide for performing Who songs and entire albums (such as Live at Leeds) exactly as they were originally recorded, Bargain recreates The Who like few others can. Complete with on-stage theatrics that are trademarks of The Who concerts, including the spectacular Laser Show made famous in the Who's 1979 film "The Kids are Alright", Bargain provides an experience which leaves audiences truly believing that they are witnessing an actual Who concert from the 1970's. Check out BARGAIN'S astonishing tribute to the greatest Rock and Roll band of all time - THE WHO!"